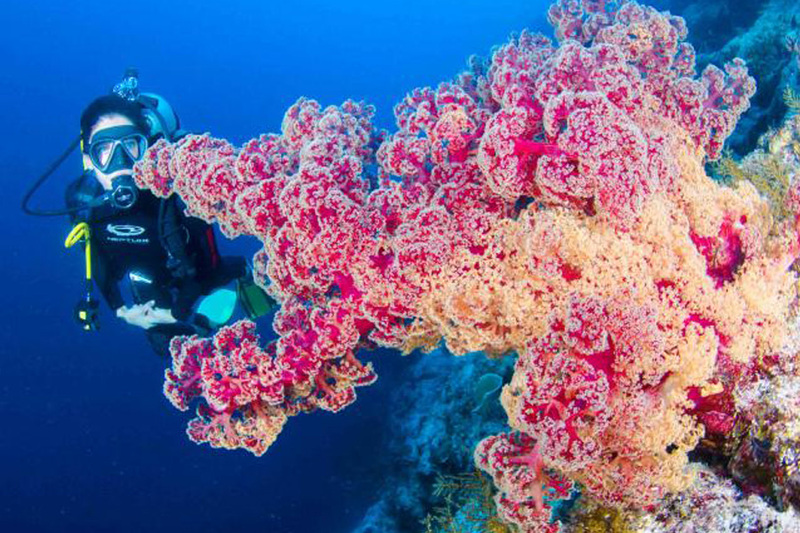 Mike Ball 4 day, 4 night Fly and Dive Coral Sea offers advanced divers the ultimate diving getaway. For four days, divers will get to explore the Great Barrier Reef and Coral Sea, getting to experience the thrill of some of the best diving locations around. With diverse marine life, amazing corals, sharks, turtles, caves, caverns and more on the agenda, this is a great way for avid divers to explore the beauty of the Great Barrier Reef Marine Park and Coral Sea. Check in between at the Mike Ball office between 8.30am and 4pm before your group meet up at 4:00pm. At 5:50 guests will board Spoilsport, their home for the next 4 days, and make their way out to out to the reef. This evening will be spent relaxing, briefing for the next few days and organizing your dive equipment. Guests will begin their day bright at early so they can start diving right away. This day will include possible dives at Ribbon Reef #9 - Pixie Gardens and Cod Hole. Divers can expect to see diver size potato cod at Cod Hole, as well as napoleon wrasse, barracuda and Maori Wrasse at other dive sites. With frequent sightings of rays, sharks and turtles, this will be a diving day to remember. The night dive is a great place to spot more elusive sea creatures such as moray eels, crayfish, decorator crabs and egg cowry shells. Guests will have an early breakfast before making their way back onto land, only to enjoy a beautiful scenic flight back to Cairns! The low level flight takes about 1 hour and allows you to see the beautiful reefs in a whole new way from an amazing vantage point. False Entrance - Osprey Reef - Coral Sea: False Entrance at Osprey Reef is full of fish action as well as an abundance of beautiful corals. Known for its colourful gorgonian fans, resident barracuda and school big eye trevally, this location is a great spot to capture some amazing underwater photos. Dungeons & Dragons - Bougainville - Coral Sea: This maze of caves, tunnels and swim throughs is a great place to discover fish and other critters of the Coral Sea. Divers can venture out over the reef top to a wall that descends 1000m, where sharks and barracuda hang out. Clam Beds - Great Barrier Reef: Clam Beds are known for the giant clams that are spread out over the reef slope. Over a metre in length and weighing 200kg, the vibrant colours and fascinating structure make for great photo opportunities! Joani's Joy - Great Barrier Reef: This beautiful location has a diverse landscape of coral gardens, coral walls and caverns. Hard coral bommies ride vertically from 20m where blue damsels, sweetlips and cuttlefish frequent. Amazing - Holmes Reef - Coral Sea: This location is great for exploring with a maze of bommies that have created tunnels and swim throughs for visiting divers and the resident fish. Here you may see octopus, cuttlefish, rock lobster and even grey reef and silvertip sharks. Your four day tour may take you to other amazing dive sites including Steve's Bommie, Nonki Bommie, MV Antonio Tarabocchia, Fairy Grotto, Admiralty Anchor, Crystal Plateau, North Horn and Western Wall. All locations offer something different to explore, discover and enjoy beneath the ocean's surface. Please note that the Itinerary subject to change. Luggage restrictions are 25kg / 55lb per person plus 3kg / 6.5lb â€“ carry on and an additional 10kg/22lb is allowed for professional photo/video housed systems. This tour is only suitable for advanced divers. 25kg / 55lb per person plus 3kg / 6.5lb â€“ carry on.